January 2015 is an exciting time to visit the Wallace Collection. The Dutch paintings – the most important collection in the United Kingdom after the National Gallery and the Royal Collection – can be seen in three picture galleries which were refurbished in Spring 2012 and have been rehung around the following themes: Rembrandt and his school, scenes of everyday life, and landscapes by the Dutch Italianates. The newly rebuilt and refurbished Great Gallery, reopened in September 2014, also showcases Dutch and Flemish painting in a new hang which emphasises the exchange between artists and artistic centres in the seventeenth century. The new hang in the East Drawing Room focuses on Antwerp and Brussels as artistic centres, with a special display of Rubens’s oil sketches. Lucy Davis, Curator of Old Master Pictures, invites participants to investigate three intriguing paintings in the collection, whose attribution remains uncertain. The first, A Young Woman in a Kitchen, is a small kitchen scene by an unknown Dutch painter to which Lancret added a figure in the eighteenth century. It is a rare surviving example of such a ‘palimpsest’ image, from which the later addition has not been removed. Recent dendrological analysis has revealed that the kitchen scene was painted no earlier than c. 1680, which may enable us to establish its author more precisely. The second hour of discussion will be devoted to two paintings attributed to the circle of Rembrandt: a small ‘trony’ of a boy in fanciful costume, which has previously been given to Dou and perhaps more plausibly, Flinck. This delightful painting is one of the ‘discoveries’ made during the recent rehang of the Dutch galleries. The second painting is the monumental The Centurion Cornelis (The Unmerciful Servant) which hangs in the newly refurbished Great Gallery and which has been attributed to Karel van der Pluym. The Courtauld Gallery houses one of the most significant collections of works on paper in Britain, with approximately 7,000 drawings and watercolours and 24,000 prints ranging from the late Middle Ages to the twentieth century avant-garde. Among these the Dutch and Flemish schools are strongly represented with about 1,000 drawings, including a number of internationally renowned masterpieces from the Renaissance and Golden Age by Bruegel, Rubens and Rembrandt to name just a few. Whilst the majority of the collection came to the Courtauld with the bequest of Sir Robert Witt in 1952, many of the finest Old Master drawings came via Count Antoine Seilern’s extraordinary Princes Gate bequest in 1978. Participants in this visit will have the opportunity to study a selection of the Dutch and Flemish drawings closely, including some of the collection’s master drawings. Presently the Courtauld is preparing the catalogue raisonné of Dutch and Flemish drawings; Sir Christopher White, one of the lead authors, plans to be present during the visit. Participants will also have the opportunity to discuss some questions, including open attributions, related to this catalogue project. The Picture Gallery at Buckingham Palace, one of the nineteen State Rooms, displays some of the greatest paintings in the Royal Collection. It was created by the architect John Nash as part of his transformation of Buckingham House into a palace for George IV in the 1820s. The hang in the Picture Gallery is changed quite regularly, as the Queen lends many paintings to exhibitions around the UK and overseas. The current display brings together Italian, Dutch and Flemish works mainly from the seventeenth century, grouped by subject and artistic nationality. Among the great artists represented are Titian, Rembrandt, Rubens, Van Dyck and Claude. Desmond Shawe-Taylor, Surveyor of The Queen’s Pictures, and Lucy Whitaker, Senior Curator of Paintings at the Royal Collection, will be joined by Rosanna de Sancha, Royal Collection Paintings Conservator and colleagues in leading a tour of the Picture Gallery at Buckingham Palace. This will allow an analysis of the masterpieces collected in the early nineteenth century by George IV including The Passage Boat by Aelbert Cuyp, The Music Lesson by Johannes Vermeer, A Courtyard in Delft by Pieter de Hooch and two Rembrandts: The Shipbuilder and His Wife and Agatha Bas. They will share the latest scientific research into these paintings and will welcome expert discussion. The British Museum in London holds one of the greatest collections of works on paper (prints, drawings and watercolours) worldwide. With almost 100,000 drawings and between 2 to 3 million prints it covers works of art from every art school, ranging from the fourteenth century until the present day. A selection of their finest masterpieces from the Dutch and Flemish prints and drawings collections will be on display during this private visit at a time when the Study Room is closed to the public. An Van Camp, curator of Dutch and Flemish drawings and prints, will show you some works which have never been lent outside of London because of their fragility. These include, amongst others, a group of rare colourful etchings by the printmaker Hercules Segers (c. 1589-c. 1638), as well as the Costume Book by Peter Paul Rubens (1577-1640) and the sketchbook Anthony van Dyck (1599-1641) used while he was in Italy. You will also receive an exclusive preview of the forthcoming exhibition on silverpoint drawings. Drawing in Silver and Gold: Metalpoint drawings from Leonardo to Jasper Johns is jointly organised by the British Museum and the National Gallery of Art in Washington, to be held in 2015. The selection of drawings will focus on those Dutch and Flemish works which reveal the different practices and functions of the silverpoint technique. Early-Netherlandish examples by Rogier van der Weyden and his workshop, as well as later works by Hendrick Goltzius and Hans Bol will be included. The Victoria and Albert Museum grew out of the 1852 Museum of Manufactures, which was founded with the aim of improving the design skills of British craftsmen. Among the Museum’s rich collections of objects purchased or presented are many significant examples of Dutch art and craftsmanship. 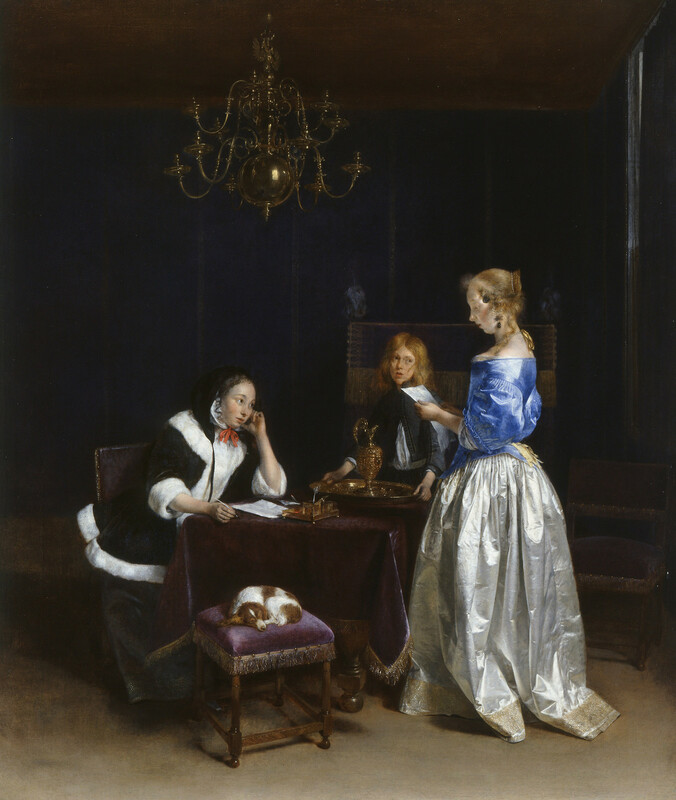 Ana Debenedetti and Kirstin Kennedy will lead two separate sessions which offer CODART delegates the opportunity to closely examine and handle Dutch works on paper and Dutch silver. The sessions will each last about an hour, and will be repeated, so delegates will be able to see both types of object. Delegates are also welcome to explore the Museum on their own. The Prints and Drawings collection owns a wide range of works spanning over a period of four centuries: from preparatory studies to highly-finished presentation drawings, primary ideas and sketches made after nature. Among the highlights Ana Debenedetti will make available to the CODART historians are drawings by Rubens, Jordaens, Van Dyck and Rembrandt but also a remarkable album of topographical views by Anton van den Wyngaerde. The recently-published catalogue of Dutch and Flemish drawings by Jane Shoaf Turner and Sir Christopher White will also be available for consultation. The sessions on silver, led by Kirstin Kennedy, will include seventeenth and eighteenth century pieces from Leeuwarden and The Hague, as well as a tiny sixteenth-century pyx made by the ‘s-Hertogenbosch goldsmith Willem Geverts. The pyx is particularly interesting because the name of the nun who owned it, sister Alyt Henryx, is engraved on the base. Contemporary records show she was cloistered at St Elizabeth Bloemenkamp ‘behind the toll-bridge’, in ‘s-Hertogenbosch. Delegates will also have the opportunity to handle silver by contemporary Dutch makers who have been inspired by the work of their forebears. Candlesticks by the leading Dutch goldsmith Jan van Nouhuys, who works in Schoonhoven, are inspired by the flowing forms which characterise the seventeenth-century works of Christian Van Vianen, and the intricate detail pierced into a dish by the Haarlem-based goldsmith Carla Nuis is inspired by sixteenth-century Italian velvets.